As soon as you walk in unit 1004, you’ll never want to leave. 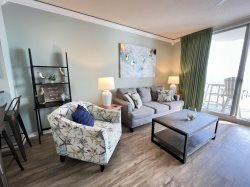 This three bedroom/three bath condo is beautifully decorated and truly "ShipShape" but also comes with a covered parking space making things very convenient. The colors the owners have used are tastefully indicative of an upscale beach home. Enjoy the balcony as you sit and have a cup of morning coffee or watch the dolphins play in the beautiful emerald waters of the Gulf of Mexico. This corner unit really opens up with large windows bringing in light and even more Gulf views. The master bedroom has its own access to the balcony allowing your own private piece of paradise. Unit 1004 comes with a full-sized washer/dryer for your use and a kitchen with a full-sized refrigerator, microwave, stove, dishwasher and all the necessary tools and gadgets to create your own meal. There is ample seating with a dining table seating six and four bar stools. Everyone in your party can sit and enjoy a meal and have plenty of space. You’ll love this beautiful home and will want to come back and visit again and again making vacation memories last a lifetime. Every question I had was answered through the staff promptly they were very friendly and very welcoming. The place was very clean and had plenty of room for all 8 of us. The view was amazing and would love to come back next year. Really enjoyed our stay and will definitely return again.